One of my goals in resurrecting this blog is to document some of the simple joys that come from living here. 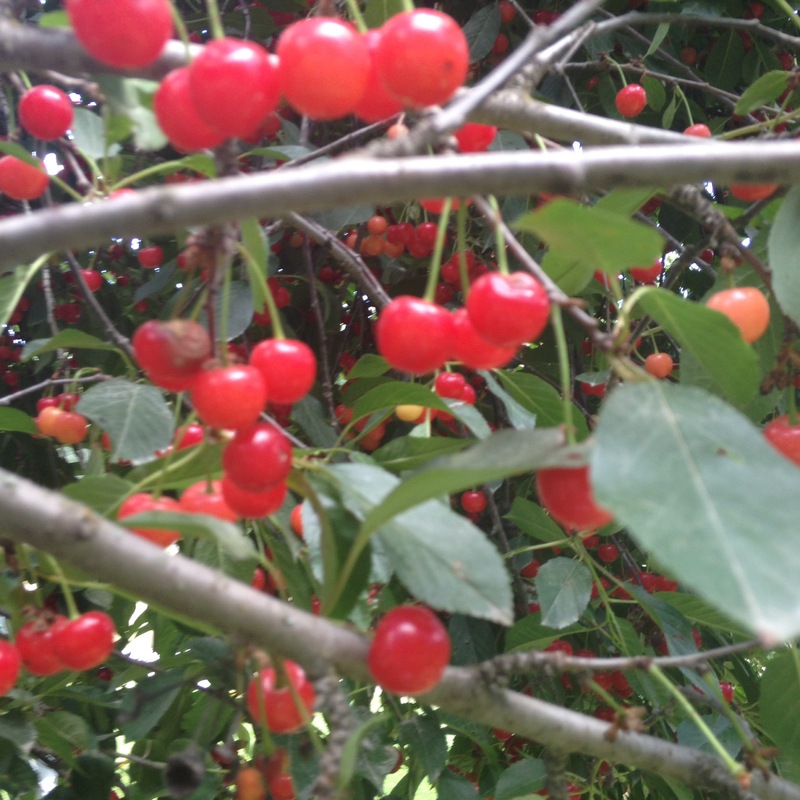 For example, yesterday, my to-do list didn’t include picking cherries or making pie. But then my sister called to say that her tree was overflowing, and would I be interested in picking some pie cherries? Well, obviously! 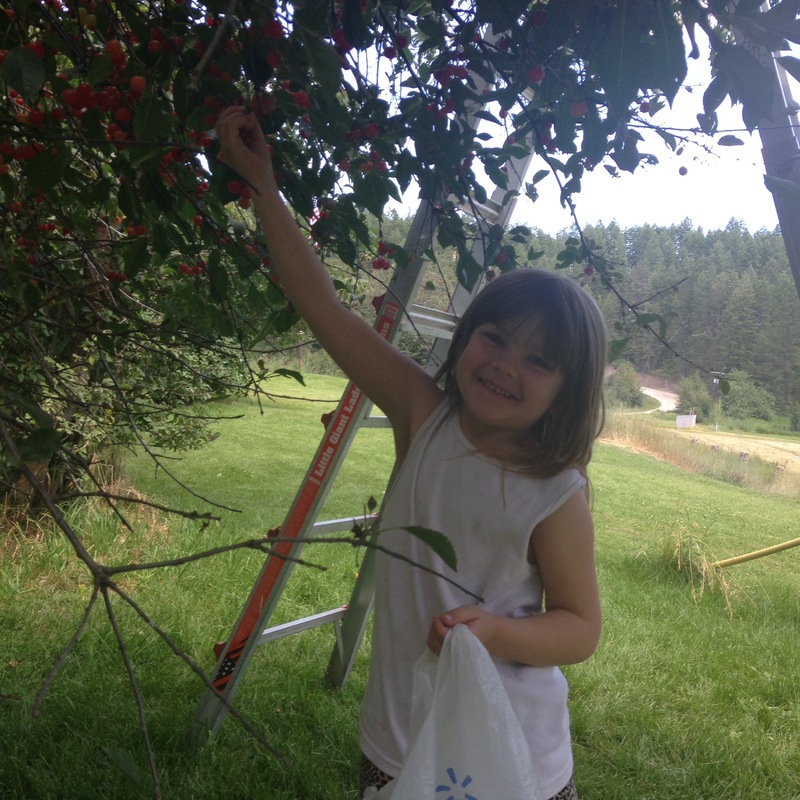 It was a beautiful day for picking cherries — sunny, but not too hot. Jayme, Jeffrey, and Ellie helped me fill my bag. 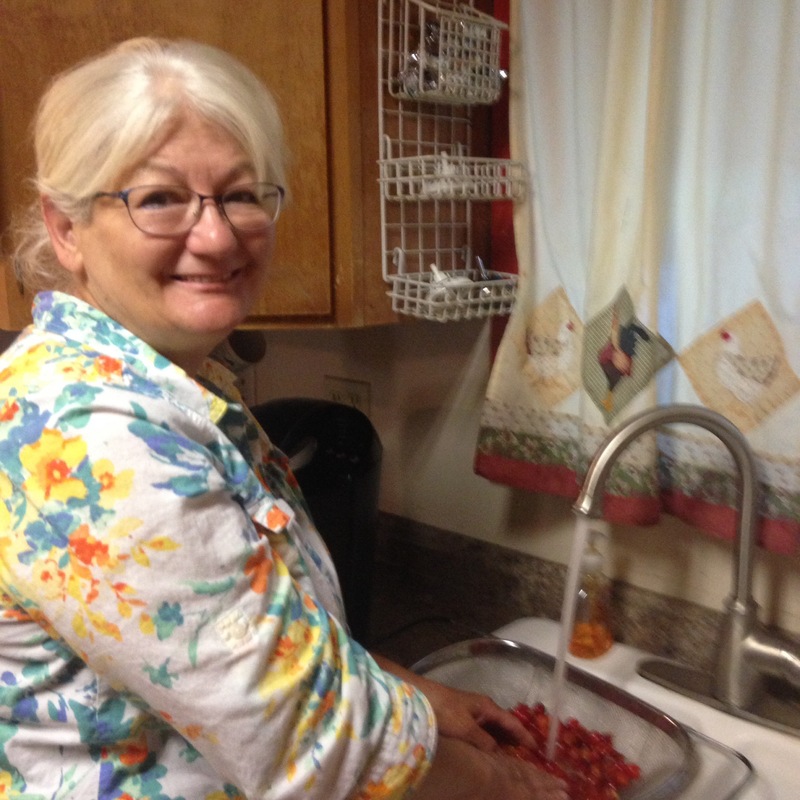 Afterwards, I took the cherries to Mom’s house to process. Her kitchen just works better for that kind of thing. 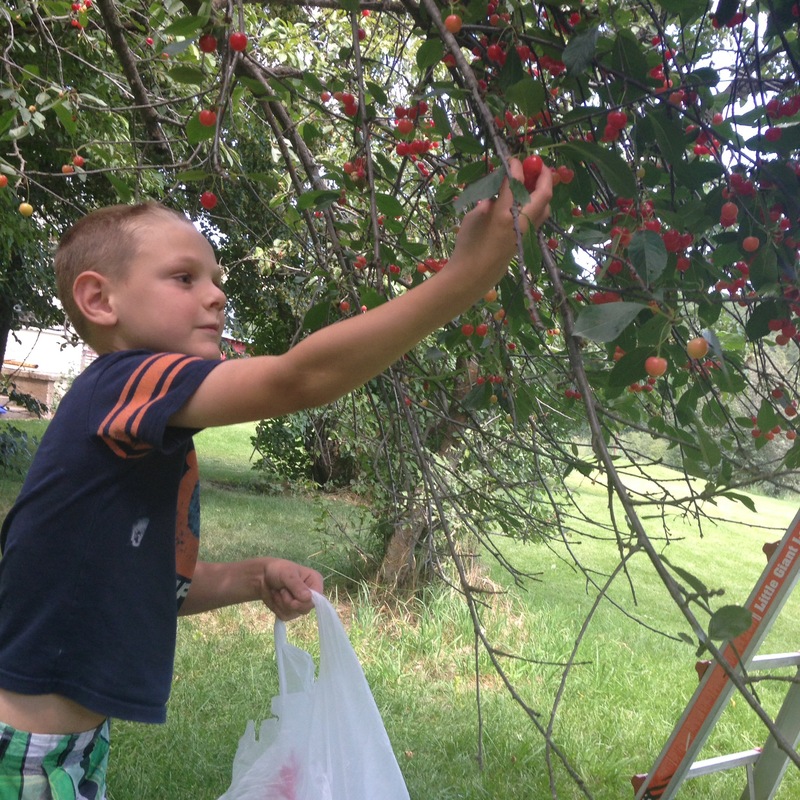 Mom took pity and helped me pit the cherries. There were A LOT of them! Neither of us owns a cherry pitter (I can’t stand cluttering up my very limited kitchen space with single-use items), so we experimented with a few techniques. I started off just shoving a straw into the cherries and poking the pit out the other end. Mom showed me a prettier technique that my grandma taught her: by putting your thumb over one end of the straw, you can pull the pit right out the top of the cherry, leaving only one hole. But in the end, since these were pie cherries and didn’t need to look pretty, we settled on the most expedient route: popping the pits out of the cherries with our bare hands. It’s the messiest option, but definitely the quickest. After two hours pitting cherries, quick was good. I also found this method most reliable for finding the rare, wormy cherry. Twice, after squeezing the pit out of the cherry, I’d find all this sandy residue on my hand. Sure enough, when I halved those cherries, I found worms inside. Mom helped me make pie filling afterwards. We ended up with enough for five pies — one to make immediately, and four to freeze for later. Sunshine, cherries, and family. A Thursday can’t get much better than that. 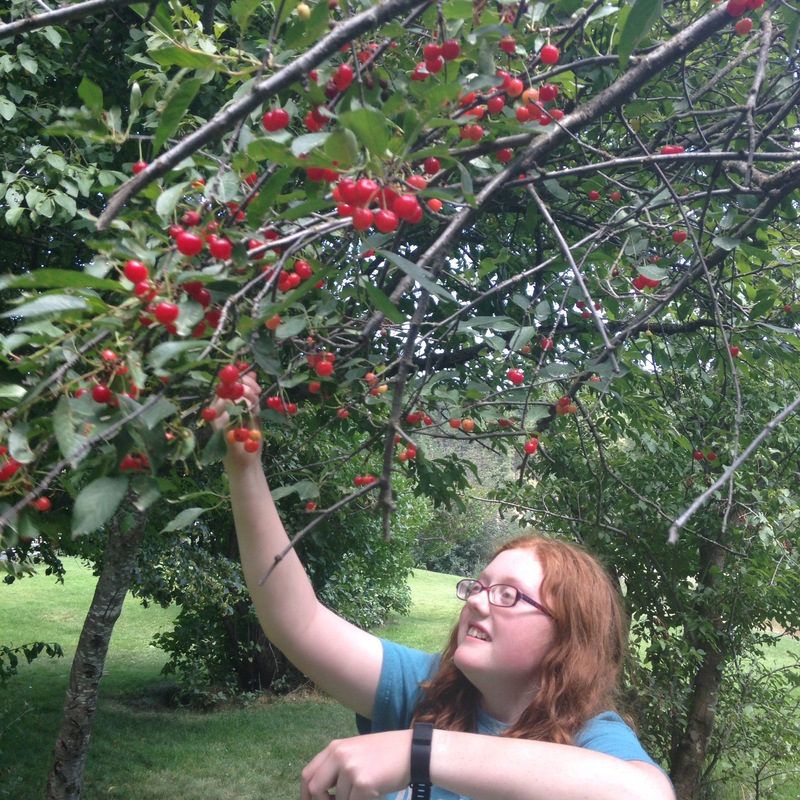 Wow, Mindy, That’s a lot of cherries! I happen to have TWO cherry pitters and would be happy to give you one! Just give me a heads up and I will be happy to share. The kids have grown again haven’t they? STOP!!! Before we know it you will be all grown up, and going your own ways. Cripes, I wish there was one way that we could stop kid’s from growing up, they are wonders all in themselves! Gary and I plan on being there to visit in three weeks, I hope that you will come over and say hello. I love having family finally! Hope you are having a great summer, give Uncle Drew a big hug and kiss and Aunt Mindy too!